A filling, flavorful peasant dish made with the cheapest, most readily available ingredients, Irish stew reflects the history of Ireland itself. The Irish raised primarily sheep and root crops for subsistence. The sheep provided wool for warm clothing, milk for drinking and cheese making, and eventually, meat after the animal reached the end of its productive years. Potatoes were the main food crop, prior to the potato famine. An 1800s ballad celebrated the homey satisfaction of a hot bowl: "Then hurrah for an Irish stew / That will stick to your belly like glue." Irish stew, "ballymaloe" or "stobhach gaelach" as it is called in Gaelic, traditionally contains chunks of lamb or mutton (less tender meat from sheep more than two years of age), potatoes, onions and parsley. Often the neck bones, shanks and other trimmings were the only basis for the stock. Yet these would-be discards still held enough flavor after two to three hours of simmering over an open fire to do justice to a hearty bowl of stew. The root vegetables added flavor and thickening power, as well as filling sustenance. Some cooks added turnips or parsnips, carrots and barley when available, though purists say true Irish stew contains only meat, potatoes and onions. 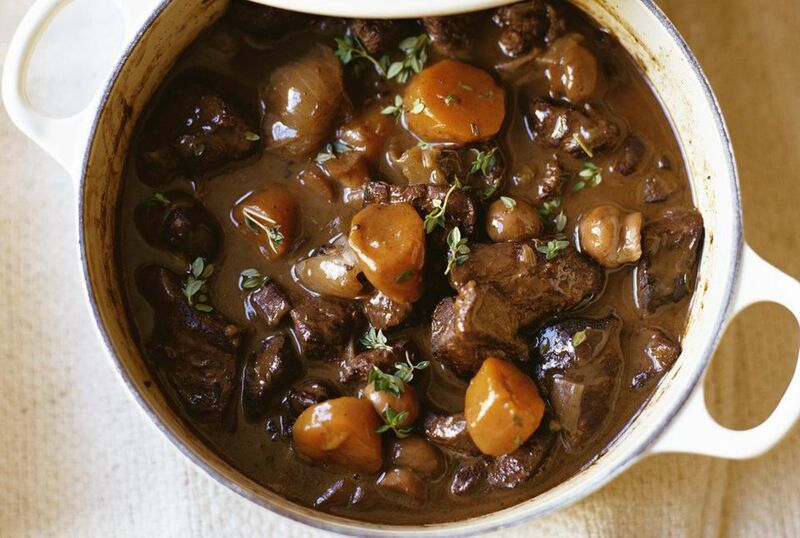 Made in the traditional manner, the stew becomes thick and hearty, not thin like soup. When the Irish began immigrating to the United States in large numbers in the mid-1800s, fleeing from the starvation caused by the potato famine, they naturally brought along their food traditions. The hearty stew evolved and adapted to include locally available products. Sheep were not as plentiful in America, so cooks substituted beef and other more readily available meats. The classic recipe further evolved in the New World, where contemporary versions include ingredients such as Guinness stout beer and parsley dumplings. Irish and non-Irish chefs alike have tinkered with the original recipe, and some of the resulting variations lift this original peasant dish to near gourmet status. Wine often replaces some of the stock, garlic adds a recognizable nuttiness, and other herbs join the parsley to add depth to the bouquet. With the new interpretations, Irish stew may be served in a bread bowl, over a bed of polenta or an ancient grains pilaf, or with a wedge of Irish soda bread on the side. But whether you enjoy a classic rendition or a more modern take, you can always find Irish stew on restaurant menus for St. Patty's Day. And if you want to give a simmering pot a go on your own stove, traditional recipes and creative interpretations abound. Here are a couple of cookbooks that could get you started: The New Irish Table: 70 Contemporary Recipes, by Margaret M. Johnson and Irish Traditional Cooking, by Darina Allen.